Most people just consider dandelion to be a nuisance. But I think they will most likely be more welcome to you by the time you finished reading this article. Dandelion is officially Taraxacum officinale – the name comes from the French words ‘dent de lion,’ that mean ‘lion’s tooth.’ This is a reference to the jagged-edged leaves. From a pharmaceutical point of view, the herb has many qualities: cholagogus, choleretic, alkalizing, laxative, diuretic, venotonic and astringent. The root contains a bitter compound – taraxacina – pectins, and sterols, vitamins B1, C and D, inulin, tannin and reshines. With a high amount of vegetal fibers, dandelion prevents the unwanted assimilations of glucose and facilitates the elimination of feaces. The contained potassium is responsible for the diuretic action. Dandelion also contains curative substances which are very important for treating metabolism disorders. The substances contained by dandelion stimulates the stomach's activity as well as the liver's and bile's, causing a high diuresis and helping an organism to eliminate, trough urine, the toxic products of metabolism. Dandelion can be successfully used in cases of hypoacid gastritis, dyspepsia, biliary dischinesis and for preventing the formation of renal calculi. The diuretic effect also helps eliminate the renal calculi. Trough the diuresis it causes, dandelion eliminates toxins and indirectly helps treat eczema and other skin diseases. Because of the contained vitamins A and C, dandelion is also known as an anti-oxidant and anti-cancer agent. Dandelion in your yard is identical to the herb with so many benefits. • Anemia. Dandelion contains high levels of potassium, is a rich source of iron and vitamins, and, ounce for ounce, contains more carotene than carrots. 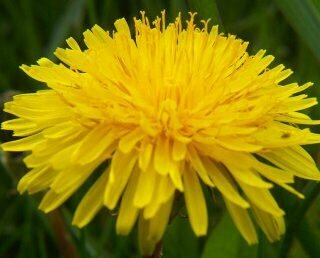 Herbalists have used dandelion for generations to treat anemia due to deficiencies of folic acid, iron, and vitamin B12. • Bladder infection and premenstrual syndrome (PMS). Unlike many conventional diuretics, which cause a loss of potassium, dandelion leaves are rich in potassium. Using the herb as a diuretic results in a net gain of this vital mineral. Because of its diuretic effect, dandelion helps to relieve fluid retention in premenstrual syndrome (PMS) and counteract urine retention in bladder infections. By increasing potassium levels, dandelion aids in alleviating muscle spasms and nighttime leg cramps. • Constipation, hemorrhoids, and indigestion. German research has shown that dandelion root is a mild bitter, or appetite stimulant. Bitters of all types activate a reflex that increases the secretion of digestive juices by the lining of the stomach. Dandelion root has a significant cleansing effect on the liver by stimulating the production of bile, which ultimately results in increased transport of a variety of potentially noxious compounds to the stool. Increasing the release of bile also relieves constipation without causing diarrhea and stops spasms of the bile duct. Dandelion should be avoided, however, if you have gallstones, since increasing the flow of bile could increase pressure against the stones. • Irritable bowel syndrome (IBS). Bulgarian studies of a five-herb combination including dandelion found that more than 95 percent of IBS sufferers were pain-free after fifteen days of treatment. This herbal combination also improved regularity. • Liver problems and gallstones. The bitter principles in dandelion increase bile production and bile flow in the liver. This makes it useful for people with sluggish liver function due to alcohol abuse or poor diet. It is restorative to the liver and helps reduce the risk of developing gallstones, but you should avoid it if you already have gallstones. • Osteoporosis. Dandelion is a rich source of boron, which helps to raise estrogen levels in the blood, and in turn helps preserve bone. It is also a rich source of calcium and a fair source of silicon, which some studies suggest helps strengthen bone. • Weight Loss. European herbalists frequently prescribe dandelion tinctures as a weight-loss aid. Dandelion reduces water weight through its diuretic effect. It may also help the liver regulate blood sugars to avoid hypoglycemia (low blood sugar), frequently an immediate cause of binge eating. Also, the increase in bile flow stimulated by dandelion helps to improve fat metabolism in the body. In one laboratory study, animals that were given daily doses of dandelion extract for a month lost up to 30 percent of their body mass. • Diruetic and blood purifier. Dandelion leaves are a powerful diuretic. The roots act as a blood purifier that helps both the kidneys and the liver to remove toxins and poisons from the blood. The roots have been used for centuries to treat jaundice. • Good for bowels, appetite, digestion. Dandelion also acts as a mild laxative and improves appetite and digestion. It is useful for eczema-like skin problems, boils, and abscesses, and is believed to help prevent age spots and breast cancer. **Cautions** If you are taking diuretic drugs, insulin, or medications that reduce blood-sugar levels, you should use dandelion only under a physician's supervision. People with known allergies to related plants, such as chamomile and yarrow, should use dandelion with caution. Dandelion also should be avoided during antibiotic treatment, especially treatment with ciprofloxacin (Cipro), ofloxacin (Floxin), lomefloxacin (Maxaquin), norfloxacin (Noroxin), and enoxacin (Penetrex), since it may keep concentrations of these antibiotics from peaking in the bloodstream, diminishing their ability to fight infection. -Boil a quart of water in a pot Reduce the heat. -Add 2 tbsp. of cleaned and chopped fresh dandelion roots to the water. -Let the water simmer for thirty minutes, keeping it covered during this time. Then, remove the pot from the heat source. -Following this, add two tbsp. of freshly picked and chopped dandelion leaves. -Let the leaves steep into the liquid for twenty minutes. After which, the liquid can be strained. You will benefit by drinking two cups of the herbal dandelion tea every day. Starwest Botanicals is who we trust as our on-line supply source for bulk herbs and natural products. Dried herbs, organic herbs, bulk spices, loose leaf organic teas, organic essential oils and aromatherapy supplies are part of the nearly 3000 natural products to choose from at Starwest Botanicals. Great herbs, oils and other natural products – at great prices – from a name we here at NHH trust! Learn more about StarWest Botanicals!